Ag producers are a whole lot easier to reach than they used to be. Not so long ago, you didn’t reach a rancher until after dark—and that was iffy. You just planned on not reaching a farmer at all until harvest was over. Times have changed, and now farmers and ranchers carry their phone books, weather channel, market reports and newspapers in their pockets. They want news and information when it’s fresh, but at the end of the day, they still want to kick off their boots and thumb through the paper, hoping to come across a tractor like that one they wish they hadn’t sold. With a media mix that includes our flagship newspaper, real estate guide, breeder information, social media, email newsletters, targeted digital advertisements, and more, we reach the agriculture industry wherever they happen to be looking. The Fence Post is published once a week and is distributed across Colorado, Nebraska, Wyoming to folks who actively participate in, are retired from, or support the farming and ranching lifestyle. Over 76 percent of our readers have at least a small acreage. 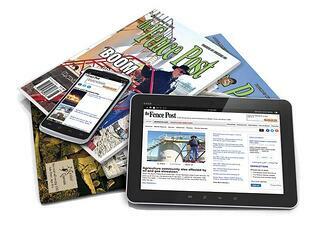 Online, www.thefencepost.com sees an average of 23,634 unique viewers each month. The Fence Post has unparalleled reach in the agricultural communities of the West, with each reader spending up to three hours with each issue and each issue being passed along 2-3 more times. 44% of online visitors to the www.thefencepost.com are from Colorado, Wyoming and Nebraska; 56% of digital traffic is from areas outside of these states. Please speak with one of our account managers to learn more about how you can reach ag audiences across the western United States.